The JBL® Commercial CSM-21 offers fixed I/O, pre-configured architecture, full stereo or mono operation, flexible routing and control of multiple audio sources, simple front-panel configuration and control without the need for a computer, compatibility with the CSR wall controllers, compatibility with the CSPM paging microphones, and optional duplication of audio channels to another device via a Cat5 cable. 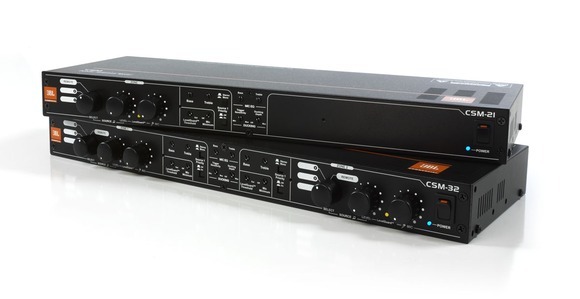 Dedicated controls for music EQ and dedicated controls for global mic EQ allow the frequency content of each input type to be customized independently. LevelGuard™ is provided to retain consistent volumes between the various inputs, and AutoWarmth™ is provided to ensure full fidelity at all zone volume levels.